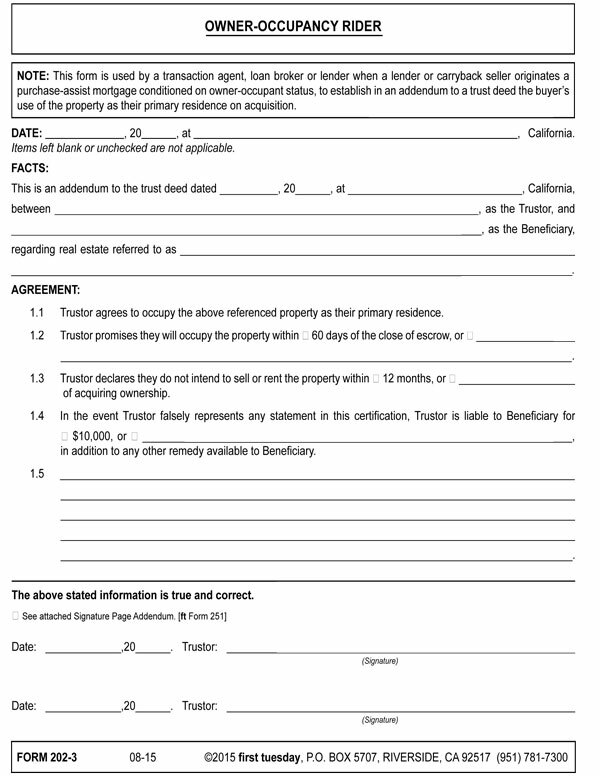 This form is used by a transaction agent, loan broker or lender when a lender or carryback seller originates a purchase-assist mortgage conditioned on owner-occupant status, to establish in an addendum to a trust deed the buyer’s use of the property as their primary residence on acquisition. California ranks among the states with the highest risk level for mortgage application fraud in the nation. Homebuyer occupancy misrepresentation is the most common form of mortgage application fraud in the state. Buyers of houses misrepresent their occupancy intentions with the goal of inducing the lender to originate a lower interest rate consumer-purpose mortgage with minimum down payment requirements available only to occupant buyers. Further, a carryback seller may also be looking for the security that an owner occupant has to offer versus an investor, who can more rationally walk away from their investment in times of recession and hardship. one to hold until it can be promptly flipped at a profit. The current high demand for rental accommodation in California tempts more and more speculators and investors to commit what they incorrectly believe is merely a minor infraction. However, when the speculator or investor gets caught, the mortgage holder may call the mortgage due, demanding immediate repayment of the balance. Further, borrowers caught committing mortgage fraud are flagged by name on Suspicious Activity Reports (SARs). SARs are filed with the Financial Crimes Enforcement Network (FinCEN), a database maintained by the federal government. As penance for their fraud, these alerts will prevent the listed speculators and investors from obtaining new mortgages or refinancing existing ones, regardless of their legitimacy. In addition, the Owner-Occupancy Rider holds real estate investors and speculators accountable for their decisions. Thus, it reduces the risk of default and foreclosure faced by mortgage lenders and carryback sellers and decreases the likelihood of acquiring a mortgage on a rental property with its risk of nonperformance.